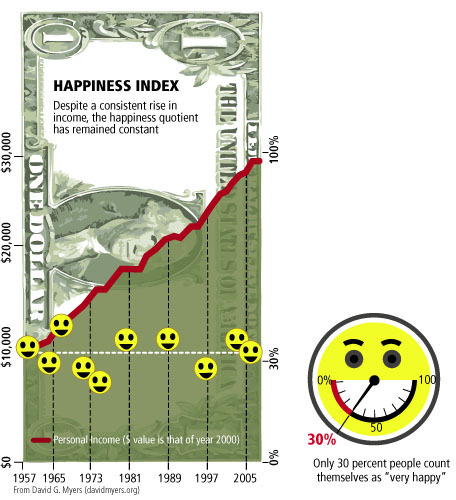 Should we include happiness in how we measure the economy? Let’s face it. Gross Domestic Product (GDP) is the most accepted measure of national economies, but hardly an accurate one. It leaves out so many variables that it shows many countries to be richer or poorer than they really are. GDP ignores the depreciation of capital, be it disappearing forests or ageing labourers, says Romina Boarini, an economist at the Organisation for Economic Co-operation and Development (OECD). And GDP nonsensically goes up after a natural catastrophe. When an epidemic spreads and people spend on medicine, it goes up again. At least one country has known the value of happiness all along. Bhutan has been measuring its Gross Happiness Product as its standard of living since 1972. It seems to have worked somewhat. Bhutan was ranked the happiest country in Asia and the eighth-happiest in the world by a University of Leicester survey in 2006. Bhutan has a Gross National Happiness Commission and in 2008, the government found that 68 percent of Bhutanese classed themselves as being happy. Its first democratic elections were held last year. Yet the Bhutanese economy remains one of the least developed. You decide. at least half. Currently, US’ per capita GDP is 14 percent higher than France’s, according to Financial Times. More money doesn’t always bring happiness. A study cited by the Sustainable Scale Project in the US during 1957-2002 showed that as incomes kept rising, happiness levels increased up to a certain level and reached a plateau at some point. David Myers, professor of psychology at Hope College, Michigan, says, “Once people have enough money to feel secure, more money appears to yield diminishing returns.” This is seen in our daily lives too. “If I’m three times richer than my grandfather, and my car goes 65 mph faster, am I happier? It’s not a sensible measure,” Andrew Oswald, a member of Sarkozy’s commission, says. Will Single Make a Comeback For Music Fans in India?